The vast, lonely wastelands of oblivion wastelands of oblivion stretch out in all directions, infinite in their scale and in their emptiness. Darkness lies heavy over this most desolate of plains, like a burial shroud on a long-forgotten corpse. Doesn't that first paragraph sound rather dark and foreboding? I was worried this book was going to be a little scary but as you continue to read you realise exactly why the author has written the passage so darkly. His imagery in the prologue was beautifully written and really stood out for me. The rest of the book had me practically wetting myself. Don't be fooled by the prologue, it has a purpose; this book is the funniest book I have read in ages. The story is extremely surreal yet unbelievably realistic. Drake, your typical teenage boy has been recruited as the 13th Horseman of the Apocalypse after the last Death, decided to hang up his cloak and scythe. Alongside War, Pestilence and Famine, he must ride his horse across the sky to signal the beginning of the end of the world. Not really a laughing matter; but the author soon put pay to that. Drake's new mythical sidekicks are just hilarious. Each one unique and extremely lovable,despite all their flaws. Pestilence with his unusual rashes and weird inflammations will have you reaching for a face mask. My favourite character of the book had to be War. I really want to meet him! One minute they are planning Armageddon, the next they are playing Buckaroo. Priceless! I loved this book so much. I am still chuckling over the funny sketches in it a week after reading it. There is a scene in the book where Drake has to try and whistle for his horse. I nearly had an asthma attack reading it, I was laughing that much. This book is pure genius, it really is. I recommend everyone reading it. Definitely one for reluctant readers as you can easily finish it in a day. 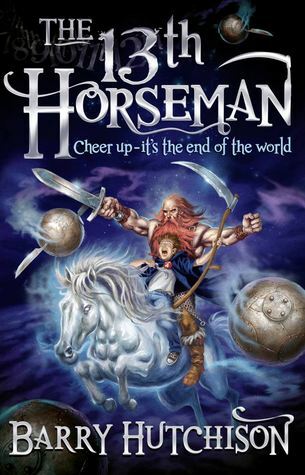 I was really sad to finish this book, as I found myself becoming quite attached to the horsemen. As of yet there is no sequel and I am hoping that Harper Collins decide to make a series out of it. An extremely entertaining rib tickler. Bring on the next Apocalypse! The cover (reminds me of Terry Pratchett's books) made me think this would be a great read so I was glad that you enjoyed the book so much - I would have been so disappointed otherwise. this one sounds soooo funny! I think I might have to get it!